Raise your hand if Chandler Bing is your favorite F.R.I.E.N.D.S. character. Same. It’s interesting because Chandler has been one of my favorite characters since I could remember, but he’s one of the characters who’s so hard to describe. And I suppose in a sense, that’s what makes him so inimitable. I still don’t actually know what Chandler does as a career, I can’t seem to ever remember if it’s clarified or not and that in and of itself is a little weird, but there’s so much to him that the simple detail of his career isn’t entirely relevant. His sarcasm and wit cobbled with his steadfast loyalty and the choice to always learn make him a remarkably unforgettable character. 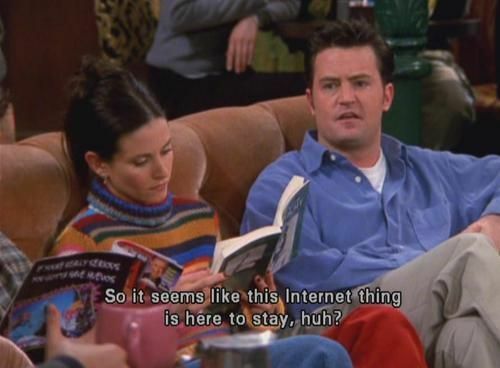 Chandler’s sarcasm and wit are my absolute favorites throughout the show. If I had to pick only one character whose reactions would be perpetually used as gifs, Chandler Bing is that character. I can’t count how many times I’ve used his “shut up shut up shut upppp” gif as a reaction of frustration in any situation. Or “I say more dumb things before 9 am than anybody does in one day.” I could use this entire article to just discuss all my favorite moments and that’d literally wind up turning into a novel. It is 10 years worth of awesome quotes. But the thing about Chandler that’s always heartbreaking is the fact that his humor is a defensive mechanism for the sadness he’s endured during a large majority of his life. And thankfully after meeting Monica, he’s able to find the means to communicate without ever losing the innate sarcasm. Chandler’s loyalty to his friends is unmatched. It’s always left me in awe how much he loves and cares for Joey — how much he sacrifices for him and mainly, how much he believes in him. The two could always find the means to enjoy their time together and when it comes down to serious moments, they’ve always been able to find the means of communication in their bromance. Their goodbye at the end of the series was the saddest one if I’m being perfectly honest. The duck and the goose no longer living across the hall from one another is unimaginable. Why couldn’t Joey just move in with them and be adopted as their eldest child? They’re odd enough where this could work. In a number of ways, Chandler hasn’t always been great with his words and though he didn’t always have the answers, his means of trying to comfort them have showcased immense loyalty and heart. There aren’t many people who would use their life as a joke in order to make other people smile, and Chandler’s done that continuously for his friends allowing them to see that where their stories are concerned, in his presence they’ll never be judged. Unless they get a really awful spray tan then he’ll judge. It takes an honorable figure to constantly want to better themselves and find ways to become the best version of themselves and Chandler did that gradually when he fell in love with Monica. He messed up a lot in his confused state but nevertheless, he grew impeccably — often choosing to set his pride aside in order to heed her advice. His choice to eventually give up smoking was a phenomenal decision and a realistic journey because while everyone knows it’s not good for a person, it’s also clear that it’s difficult to stop. But in him we have proof that it’s most certainly possible. Chandler is far from perfect, but the desire to be better is always enough. And sometimes that desire without a solution was enough. That’s perhaps my favorite aspect of Chandler’s character — he didn’t always win, but he was willing to try and as it’s been established in life, trying is surely enough. It’s everything. It’s enough to showcase a person’s heart perfectly — their goodness is so apparent, that even if they don’t know how to change things or how to make them better, because they’re trying, it’s more than enough. There’s a reason why people, myself included could watch F.R.I.E.N.D.S reruns over and over without getting tired of them, and it’s because of the raw, ridiculously flawed incredibly fascinating characters. And the actors, each in their own way, have made their characters unforgettable. Matthew Perry or Chandler Bing? To be quite honest, I don’t even know where does one begin and where does one end? Perry’s work was plainly, simply genius and there was not a single moment where I didn’t care profoundly for Chandler or want his happiness. Whatever Perry wore in his expressions, it told a thousand tales of a man who’s seen too much. At the end of the day, whatever Chandler desired, he deserved it. Let’s shout that from the rooftops, Chandler Bing and all his flawed, inimitable glory deserves happiness. He deserves all the greatness the world has to offer. I guess the internet is really here to stay, friends, but then again if it wasn’t, I’d probably never be able to write this article. To read about the friends as a whole for our #25NearestAndDearest portion of this project, check it out here.